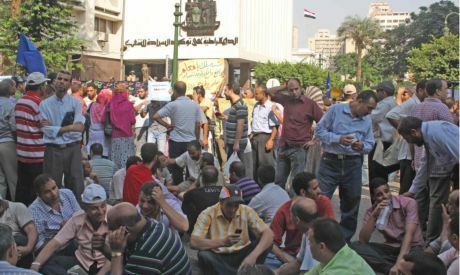 Thousands of school teachers have gathered outside the ministerial cabinet's headquarters in downtown Cairo. With teachers coming from different governorates to participate, the protesters blocked Qasr Al-Eini Street demanding the resignation of Minister of Education Ahmed Moussa. "[Prime Minister] Essam Sharaf's government cheated the teachers," chanted the protesters as they threatened to go on an open-ended strike with the beginning of the school year around the corner, on 17 September. "We are not afraid of the threats that we have been hearing from the government this whole week. We know what we want and we will fight for it," says Khaled Assawy, teacher from Beni Suef, Upper Egypt, to Ahram Online. Assawy refers to the government statement last week that no negotiations will be held with any group until they first call off their strike. The government also threatened to enforce the law implemented in March that criminalises strikes and protests. The teachers’ demands include salary raises and improvements in benefits, decent training and permanent contracts for the thousands of teachers who have been working for years on short-term contracts - and therefore lose out on benefits and seniority. "Public school teachers are among the least paid civil servants in Egypt and still they are blamed for all the corrupting in the educational system," says Ali Amin, a teacher who came from Suez among hundreds of others to participate in the sit-in. "The stereotype of a the greedy teacher who makes a fortune from sucking students' blood through private lessons is depriving us from the sympathy and support of the society, but people have to understand that if the teacher is deprived of their right they will not be able to educate their children," he explains. Ali says that the least the government can do now is to give teachers a clear timeline for meeting their demands "or else an open-ended strike is inevitable." There are more than one million school teachers in Egypt and the past year has witnessed a number of government initiatives to improve their income, but the teachers insist that many of the promises have not been fulfilled. The independent union for school teachers planned Saturday's protest in Cairo and are also the ones calling for the strike next week. Teachers in other governorates in Egypt also have been protesting this Saturday. An official source in the ministry of education told Ahram Online that the ministry might postpone the start of the school year until the beginning of October if teachers decide to strike.